One of the biggest excuses for not working out is the lack of time. By the time you get your gym bag together, drive to the gym, park, walk inside, say hi to your friends, do your workout, and head home again, you’ve taken up a good hour or two of your day. Because I know how valuable each individual’s time is, I developed this quick and easy access workout that can take only 10-30 minutes of your time. You’ll be getting your sweat on for that entire duration, not spending half of it driving. All you need today is a staircase. It doesn’t matter how many steps it has because you can make do with whatever you’ve got – in your house, front porch, or stadium. Combining these exercises will give you a total body workout. 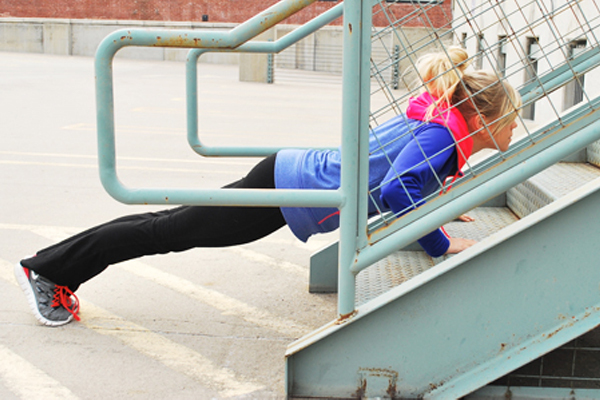 The key to reaching success is to go as long as you can without any breaks (think Crossfit). My suggestion is to do one set of each exercise until you’ve completed all seven and call that round one. Try to do 3-5 rounds all together for the total workout, and only take breaks in between each round. Each exercise should be done for 10-15 reps. Once you feel like you’ve got it all figured out, start timing yourself and try to beat your time as each round progresses. Good luck! Stair Laps: This one’s pretty self explanatory. We’re going to start with a few stair laps as our warm up to get that heart rate up, the legs stretched out and the blood pumping. For a stair case that is about 20 steps long, do 5 laps (down and back is one). Start off with an easy pace, and then pick it up after each lap. 2. 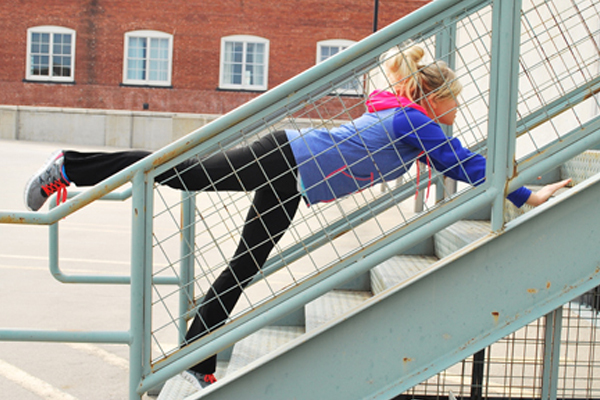 Stair Lunges: We’re going to kill two birds with one stone. By doing lunges, we’re stretching our muscles while making them work against resistance at the same time. 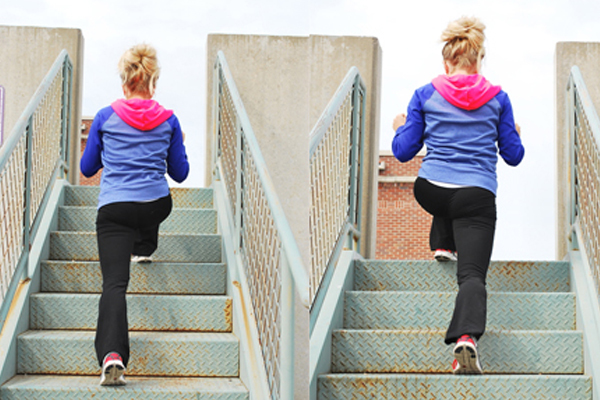 In order to do these, skip two steps at a time (or as many as you feel comfortable with) while going up the staircase. Make sure to really bend that front leg and go into a deep lunge to get the full effect. As you reach for the next step, push off the heel of the front foot. Only perform these while going UP the staircase. Once, you’ve reached the top, walk back down the stairs and repeat 2-3 more times. 3. Calf Raises: Focus on the feet in the photo above. Half of the foot is on a step while the back half of the foot is hanging off of it. There are two motions to this exercise. Raise up on your toes, pausing at half way up, and then extend so you end all the way up on your tippy-toes. Slowly come back down to flat footed in one smooth motion. This one will need to be repeated for 20 reps. You may place your hands on the rails for support, but do not put any of your weight on them. 4. Push Ups: Again, pretty self explanatory. For safety, do this one at the bottom of the staircase so your feet are on the ground. The second step up should be the perfect level to keep the entire body flat. Make sure to push with your chest (not with your arms) and bring those elbows back, not out. 5. 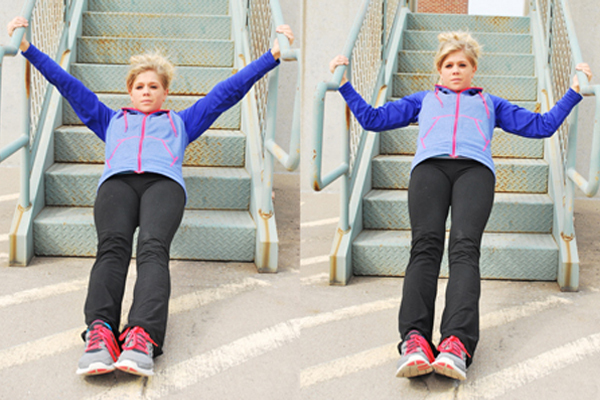 Triceps Dip: Flip yourself over from where you were just doing push ups and perform triceps dips. Your elbows should be going backwards and your triceps (back of the arms) should be the muscle you’re using to dip your body down and bring it back up (elbows will be straight when you’re at the top of the rep). Your glutes may graze the ground here, but be sure to never put any weight on it. Those of you who are advanced should keep your legs as straight as possible, and you beginners may start with bending the knees. 6. Push Ups with Leg Lift: Time to flip back over. We’ve gotten down the regular push up, so now were going to add in some more difficulty. While in the beginning of your push up position, raise one leg off the ground. This leg should be held in the air the entire time you’re doing push ups. Perform 10 reps, and then switch to lifting the other leg for another 10 reps.
7. Reverse Rows: We’re almost done with round #1. Start by sitting at the bottom of the stairs and grab on to the rails. Lift yourself up so your body is in a flat diagonal line. You will begin with your arms straight, and then pull yourself up with your arms so your head is now even with the rails and elbows are bent. The muscle we’re trying to target here is your back. Though we technically pulled ourselves up with our arms, make sure to think about using your back muscles to get you up in that ending position.